उत्तराखंड यूनिवर्सिटी ऑफ हॉर्टिकल्चर एंड फॉरेस्ट्री (UUHF) ने प्रोफेसर, असिस्टेंट प्रोफेसर, असिस्टेंट डायरेक्टर एवं अन्य पदों के लिए आवेदन आमंत्रित किये हैं. योग्य उम्मीदवार निर्धारित प्रारूप के तहत 18 फरवरी 2019 तक या इससे पहले आवेदन कर सकते हैं. 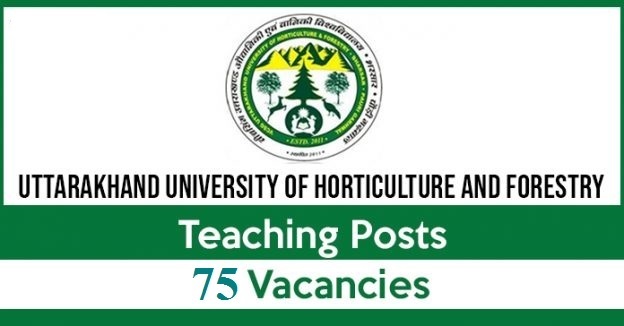 Uttarkhand University of Horticulture and Forestry (UUHF) Job Notification 2019: VCSG Uttarkhand University of Horticulture and Forestry (UUHF) has invited applications for Latest govt job recruitment for the 75 posts for Professor, Assistant Professor, Assistant Director and other. All the eligible candidates can apply for the post through the prescribed format on or before 18 February 2019. एडिशनल डायरेक्टर- एग्रीकल्चर/हॉर्टिकल्चर/फॉरेस्ट्री/सम्बद्ध/प्रासंगिक विषयों में एमएससी/पीएचडी एवं उम्मीदवार का कम से कम 10 रिसर्च प्रकाशित हुआ हो. उम्मीदवार वेबसाइट www.uuhf.ac.in से आवेदन पत्र डाउनलोड कर 18 फरवरी 2019 तक या इससे पहले स्पीड पोस्ट/रजिस्टर्ड डाक द्वारा रजिस्ट्रार, वी.सी.एसजी. उतराखंड यूनिवर्सिटी ऑफ हॉर्टिकल्चर एंड फॉरेस्ट्री, भर्सर पौड़ी गढ़वाल- 246 123, उत्तराखंड के पते पर भेज सकते हैं. If you like above information and its useful to you kindly share it with all of your friends and we are continuously working to provide you latest govt job information on daily basis. Hope you will like more to receive information related to govt jobs and stay with us on different social media plateform for more upcoming govt jobs.